Dec. 24, 2017 9:55 p.m.
It’s been three weeks of baking. It started with the banana bread. Then it was my sister’s pumpkin pie and ginger cookies. Then, more banana bread and my Grandma’s secret cookie recipe. And some gingerbread and apple pie baked by my boyfriend’s mother. Shortbread. Mincemeat tarts. Sugar cookies. Fruitcake. Rum balls. The list goes on, and yet it all feels the same. A tired, yet delicious, holiday tradition. That doesn’t stop the desire to be in the kitchen during the winter — at least, not for me. I’ve always felt my inner Martha Stewart shine during December and January. But the abundance of baked goods does create a need for creativity. Something different. Unusual, yet familiar. Striking, and perhaps somewhat ludicrous. Full disclosure: I made my marshmallows in the two weeks before Christmas. But while I had to fit my airy dessert between coconut raisin cookies and gingerbread, I imagine it is best when you can give them the primacy they deserve. It starts, as it often does, with a ton of sugar. Or, more accurately and less often, 450 grams of sugar, a third of a cup of corn syrup and half a cup of warm water. The idea is to boil the sugar until it starts to become firm — something you won’t notice until the sugar itself has cooled. When the sugar reaches the firm-boil stage, you should be able to mold it with your fingers, while still having it retain its shape. In a world without candy thermometers, this is tested by dropping small amounts of the boiling syrup into cold water. If it dissolves, it’s not ready. If you can squish it, it’s not ready. If you can’t mold it at all, you overdid it. In a world with candy thermometers, where I was lucky enough to spend my time, you simply have to wait for the temperature to reach 245 degrees. However, a marshmallow is not simply sugar. To achieve the delectable texture of a lighter-than-air dessert, you need gelatin — a gelling agent that comes from the skin, tendons, ligaments and bones of animals. Mixing the gelatin and the sugar syrup is a delicate game, one where the heat must be mastered and constant motion maintained. This is best achieved by using a stand-mixer, and having the syrup run down the side of the bowl before reaching the gelatin. 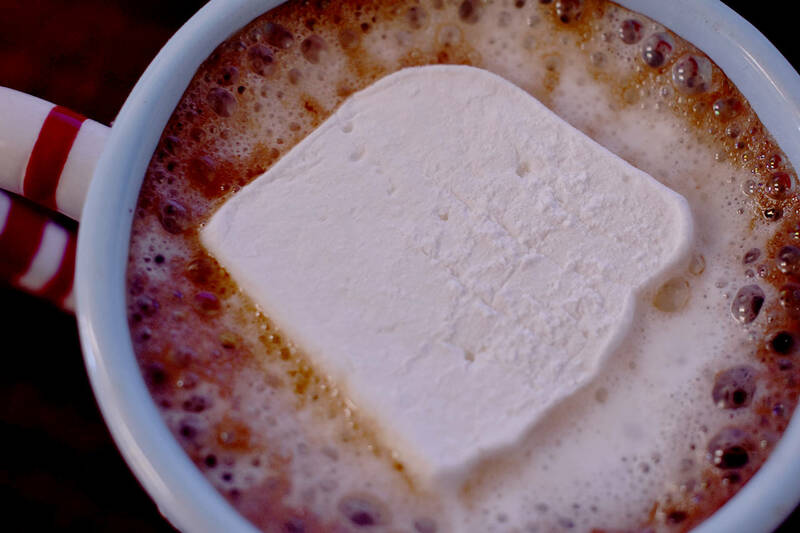 The following parts are simple, and therefore the most fun: mixing the concoction until it triples in size, applying liberal amounts of butter to the pan that will hold the marshmallows, letting it set for six hours, then cutting it into small squares. The best part is the end, holding a tin of homemade marshmallows that have the same taste and consistency of store-bought ones. The only difference between the two is that although few people would reach into a bag of Jet-Puffed and bite into a marshmallow, you can guarantee that if you offer one you made, everyone will be eating them.